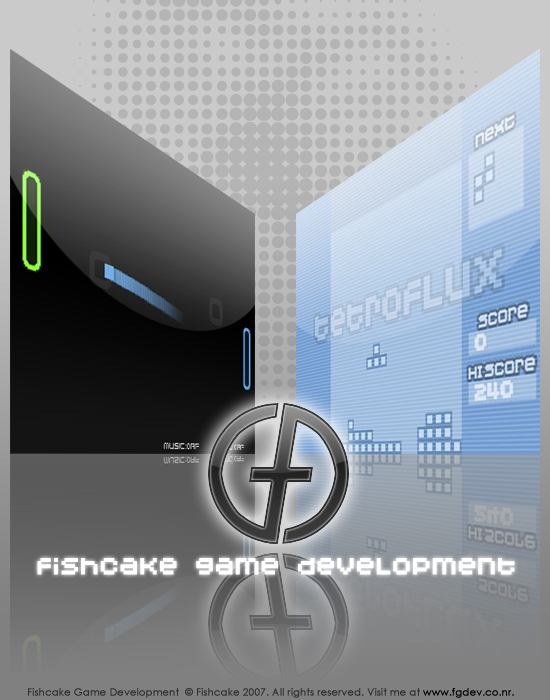 Fishcake Game Development is the name of this website, the website which I use to put my games made using Allegro. Well, it's hosted by Allegro.cc itself and created by me, Fishcake. Nothing much currently, but I hope it will soon grow slowly into a bigger, better website. [09/09/07] - Added a new game, TetroFlux. I appreciate it if you download and try the game. And give feedbacks if you like so that I can improve my games. [02/07/07] - Placed a visitor counter on the main page and the games section is now working! Complete with a short description, some screenshots and of course, a download link. [01/07/07] - Installed a cbox on this website. Drop a comment if you got something to say. It's fast and easy! [28/06/07] - I finally able to find some time to create a simple layout for this website. The header was made using Adobe Photoshop in a rush, and it looks okay to me. I don't really like the layout, but for the sake of saving time, I think I just leave it like that for the moment. I haven't created a website using only plain HTML for so long, so it's kinda hard to get used to, since I always use PHP and MYSQL for mantaining a lot of pages easily. It's valid XHTML 1.0 Transitional and also CSS! Fishcake Game Development © Fishcake 2007. All rights reserved.